Faraway Press: The Online Home of John Jackson Miller: Guest blogger Neve Maslakovic: "Pass on what you have learned"
Guest blogger Neve Maslakovic: "Pass on what you have learned"
"Pass on What You Have Learned"
I don't exactly pepper my novels with famous quotes, but I do occasionally put them in. Sometimes it’s a shortcut, a handy way of making a point — "Brevity is the soul of wit, you might say" — rather than reinventing the wheel by taking up a whole paragraph explaining whatever it is. Other times the quote is there to emphasize an idea and give it depth, or to punch up a line of dialogue. I don’t go looking for something that fits the moment; if a quote pops into my mind as I'm writing, I put it in, and so it could be something from a book, a movie, even something I’ve seen on social media. Which is why in Book 1 of my time travel series, The Far Time Incident (tagline: mystery, time travel and history), there's a tweet from astrophysicist Neil deGrasse Tyson. It's the answer Julia Olsen, science dean’s assistant at St. Sunniva University and time-traveling-mystery solver, gives to those who walk into her office doubting NASA astronauts did land on the Moon. (Atop 3000 pounds of rocket fuel, where else do you think they were going?) All right, that one was in there mostly for fun. In that book there was also a quote from the Persian poet and mathematician Omar Khayyam (The Moving Finger writes; and, having writ, Moves on: nor all you Piety nor Wit Shall lure it back to cancel half a Line, Nor all your Tears wash out a Word of it.) I felt the quote, ever so more eloquently than I could, summed up a key time travel rule in the series — try as you will, you can’t change the past. Even if you go back in time, like Julia and Nate and their companions, it just cannot be done. There’ve been Shakespeare quotes, too. Pass on what you have learned. So it was, when I needed a detail that defined a character named Jacob Jacobson, a graduate student in the Time Engineering Department, that Star Wars came to mind. I’m very fond of Jacob—in Book 1, he’s a first year grad student struggling to fit in and juggle his research and classes, but by Book 2, he’s found his footing, although Jacob himself doesn’t realize it yet. The young student is such a big fan of Star Wars that he travels to the fourteenth century with a Yoda-themed sleeping bag on his backpack. He also happens to be wearing a T-shirt with a very revealing quote, a snippet of something Yoda says just before he dies in Return of the Jedi: Pass on what you have learned. This helps Julia realize that Jacob will one day do just that, pass on the knowledge he has acquired, albeit in a non-Jedi, more mundane way — that is, he'll make an excellent professor. As an aside, I’ve learned to double-check my quotes, as I tend to misremember them. I could have sworn that Yoda in the movie says “Always pass on what you have learned,” but in fact the always isn’t there at all and hardly even makes sense in the context, Yoda hinting to Luke about the one other Skywalker. I am working on Book 3 now. I don’t know yet who will get a say in that one, because things change as you write and edit and the story comes together... Difficult to see. Always in motion is the future. 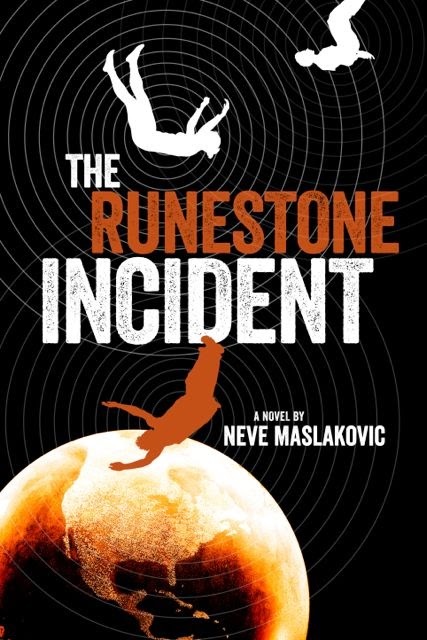 Neve Maslakovic is the author of the Incident series (time-travel whodunits), as well as a stand-alone novel, Regarding Ducks and Universes. Before turning her hand to writing fiction, Neve earned her PhD in electrical engineering at Stanford University's STAR (Space, Telecommunications, and Radioscience) Lab. Born in Belgrade, Yugoslavia (now Serbia), Neve currently lives with her husband and son near Minneapolis/St. Paul, where she admits to enjoying the winters. Booklist called her debut novel, Regarding Ducks and Universes, "Inventive... a delight." She is currently working on Book 3 of the Incident series. Visit her website, and follow her on Twitter and Facebook.